1. The Jazz Estate – We are lucky to have a club of this ilk in our fair city. Mike Honkamp, Brian Sanders, Matt Turner and now John Dye, have kept the flame burning at this historic venue for well over 15 years – before that, the infamous “Wickman era”, Sal Monreal before that,Chuck and Ed Pociecha before that stretching back into the 50’s, 60’s and 70’s. When musicians from out of town play at The Estate, universally, they feel the vibe & the history within its small confines. It is unmistakable. In its storied history the likes of Joe Henderson, Cedar Walton, Red Rodney, Eric Alexander, Al Foster, Chris Potter, Conrad Herwig, Brian Lynch, Eddie Gomez, Rudder, Arturo O’ Farrill, Jim Rotondi, Rick Germanson, David Hazeltine, Danilo Perez, The Bad Plus, Dan Nimmer, etc… For fans and musicians alike, the Estate is quite possibly the most important piece of the jazz puzzle in Milwaukee. I am excited to see what lies ahead under new ownership (John Dye of Bryant’s Cocktail Lounge). With a much needed facelift and a fresh perspective on the business side of things, the flagship of the Milwaukee Jazz scene returns this June and we are all waiting patiently! Every city needs a dedicated jazz club and this one has been it. My own feelings about the direction in which jazz should go are that there should be much less stress on technical exhibitionism and much more on emotional content, on what might be termed humanity in music and the freedom to say all that you want. 1) I had never really heard anyone sound like this on the piano. What I was hearing was a unique voice, void of recycled cliches, licks, patterns, etc. Yet at the same time, I could hear the entire history of modern jazz piano. It is ok to be yourself, after understanding your place/role in the tradition. Vis a vis the great Coltrane quote: “I’ve found you’ve got to look back at the old things and see them in a new light.” It is important to possess a vast library of vocabulary that can be delivered eloquently, intelligently, originally, and authentically. 2) Humility is an essential element in maintaining growth as a musician. Here is a musician playing as much music on the piano as I have ever heard in person…. and he is as gracious, courteous, and open minded as can be. There is NO room for ego, pretentiousness, attitude in music (and in life). The only way to improve as a musician (and as a person), is to acknowledge your shortcomings and to address your weaknesses. Every musician has a number of experiences that form who they are to become, from inspiring teachers to live concert performances that leave a lasting impression. I was fortunate at a young age to have teachers that exposed me to great music at key points in my development. My 7th grade guidance counselor gave me a copied cassette tape of 60’s-era Miles Davis, when he saw and heard that I had an inclination toward jazz music. My private lesson teacher in middle/high school and I would often spend our entire lesson trading choruses and fours along with Aebersold records – absorbing the feel and spirit of the music, not worrying about licks and patterns. One particular college professor and I would spend entire lessons playing a single tune, him accompanying beautifully and artistically on piano, with only a few words of advice… Professor: “Did you realize you were breathing every four measures?” Me: “No. No, I didn’t” Prof: “Well… don’t do that. Don’t let your ideas be confined to just four-bar increments.” All of these things were important guide posts along the way to me forming my identity as a musician. Around 1997 or 98, I was invited to attend a rehearsal with a band that was looking to add a trumpet player. Being about 18-19 years old, and not having had worked a whole lot, it was an exciting proposition. I only knew the saxophonist and trombonist casually, having played in the University Big Band with them for about a semester. The first rehearsal was in a dingy basement in a mysterious house shrouded by overgrown bushes and odd/abstract homemade sculptures – this itself was an eye-opening experience. I entered the rehearsal space cautiously and I walked in on an incredible thing – a deeply organic, earthy, spiritual – thing. I looked around the basement and saw six musicians who cared deeply about music… upright bass, hollow body guitar, drumset, congas, baritone saxophone, and trombone. I remember timidly playing through a couple charts before launching into an Afro-Cuban arrangement of “Stolen Moments” by Oliver Nelson, which I knew well. We played through the head per usual and hit the solo section into a raging 12/8 percussion deluge. My mind and soul was instantly blown wide open. Everything I knew about music was about to change. Manty Ellis is certainly what you call a treasure. His perspective on life and music is what we all hope to attain as musicians. 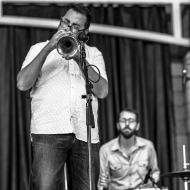 He has recently formed a new project – The Milwaukee Jazz Foundation – as a means to invigorate the Milwaukee Jazz scene. Manty is a master musician, and a master story teller. “Personally, I just like the city,” Ellis said recently. “And I have a little more of an attachment. Most people in any city were born in hospitals. I never made it. I was born in a house right here in Milwaukee on North 5th Street. And I can go back there every day of my life and I can sit in front of that front window where I was born. That house has all kinds of memories when I go back over there.” These memories include the first musician Ellis heard: his father, Grover Edwin Ellis, a pianist with a strong interest in Louis Armstrong. “I started going to the piano as soon as I could to emulate what he was doing.” Ellis said. “He saw this and started directing me a little bit. Pretty soon he started teaching. I knew more about music than the ABC’s for some time because that’s how I was taught. Just basic theories of how scales are constructed, I learned that before I started school.” Under his father’s tutelage, Ellis became accomplished enough – at age 9, no less – to be a sideman in bands around Milwaukee.